TWO WEEKS LEFT TO GET YOUR ENTRY IN!!! Writers come one, come all. Start thinking about entering one of Alberta’s best writing contests! There are five entry categories: Grades 1-3, Grades 4-6, Grades 7-9, Grades 10-12 and Adult all with great cash prizes. Pick up a brochure for specific guidelines at the Library or online at www.gppl.ab.ca. Contest closes Friday, April 3 at 6:00 pm. The Grande Prairie Public Library Friends Society will be holding their Annual General Meeting on Wednesday, March 25 at 6:30 p.m. Are you creative and motivated and would like to make a difference? The Friends are a group that believes in the importance of the Library in the community and they need you! For more information, contact Judy Dickson at 567-2716. These training essions are proving to be extremely popular with the public so we look forward to being able to offer group sessions in the new training lab in the new library! Visit the Information Desk to sign up for your one-on-one instruction with Library staff. Call 532-3580 ext 225. PS: The Wii is proving to be a hit! We had 14 teens take part in the Super Smash Brothers Brawl on March 14. Now we're thinking we should have a tournament for adults and seniors, too!" Have your say in how our community grows! Residents interested in helping to plan the direction of development in Grande Prairie are encouraged to attend a Wednesday, March 25 open house. The session will allow the public to comment on the proposed Municipal Development Plan (MDP). It runs from 2 p.m. to 8 p.m. at the Muskoseepi Park Pavilion. The MDP is a planning document used to guide future growth and development while taking into consideration the needs and concerns of citizens. The existing MDP was initially adopted in 1995. Information has been collected from surveys conducted in June, and through various focus group sessions with local residents and organizations. The City of Grande Prairie and Lovatt Planning Consultants, with assistance from ISL Engineering and Land Services, is updating the MDP to establish a policy framework and future land use concept that reflects the collective vision of the citizens on a variety of issues such as the type, level and pattern of downtown, industrial, sustainability and commercial development, the need for market affordable housing, sustainability and smart growth principles. The MDP strives to balance all views expressed in the plan preparation process. It will also incorporate the results of other planning processes under way such as the master plans for Transit and Muskoseepi Park, the Transportation Master Plan and the Land use Bylaw. Once the public participation phase has been completed, the consultant will draft a new MDP. Council’s Review Committee will evaluate the draft and if it believes the ideals of the community have been represented though the initial process the consultant will then begin the second set of focus groups in order to gain public input on the proposed draft. The goal is to have the updated plan reviewed by Council in the fall." What would happen if we took out all the signal lights in Grande Prairie and instead relied on drivers to work with each other through 4-way stops? 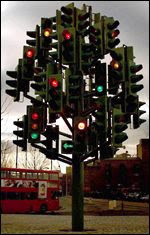 A few years ago a friend pulled me aside to say that he thought that GP had waaaaay to many traffic lights. He implored me to think about finding ways to build safe streets without putting up more lights. At the time I wasn't sure what the alternative was but now looking at how the traffic is behaving with that set of lights down I can see that moving away from standard traffic signals might be possible. "Drivers will force the accelerator down ruthlessly only in situations where everything has been fully regulated. Where the situation is unclear, they're forced to drive more carefully and cautiously." Read this Entire Article for more and view the basics behind Shared Space here on YouTube. So, is GP ready to jump on to the Shared Space bandwagon? I'm not so sure about that. But I do think drivers can be more careful, take more responsibility and that we can draw on some of the lessons from Europe as we build our community. Motorists are advised it could take up to two weeks to repair traffic lights at 98 Street and 99 Avenue and the City’s Transportation Services Department urges caution at this busy intersection. Extensive damage occurred to the signals as a result of a motor vehicle accident on Thursday evening. One of the main poles supporting the lights was completely destroyed and its base needs repair. The control cabinet was also demolished in the mishap. An all-way stop has been established at the intersection. Saturday, March 14 and Saturday, March 28 from 2:00 - 4:00 pm in the Story Room. Are you looking to start a new hobby? Maybe you’re looking for crochet patterns or ideas for scrapbooking? The Hobbies & Crafts Reference Center provides full-text content for many popular hobbies, crafts and recreational activities. More than 500 magazines and books, as well as access to 333 videos and 144 hobby reports are included. Hobbies & Crafts Reference Centre offers detailed "how-to" instructions and creative ideas in the areas of arts & crafts; collecting; games & electronics; model building; home & leisure; needlework; outdoors & nature; and scrapbooking & papercrafts. This online research tool and many more are available through the Library’s website at http://www.gppl.ab.ca. Have your membership card handy! Thanks for the update Laurie! With that I've resumed posting and will get back to a regular schedule again.